Following the sad death of my MP, Patsy Calton, the Liberal Democrats and the Conservatives are gearing up for the by-election that will soon be visited upon the Cheadle constituency. Both have recently dropped leaflets through my door. They are the usual fare, with both side saying pretty much the same thing. They want more police on the beat, they want the A555 by-pass completed. Only the Liberal Democrats say they are “fighting for local pensioners”, but I dare say the Conservatives could say the same. Things get a bit more interesting, however, with a third leaflet entitled “Community In Touch”, a title suspiciously similar to the name of the traditional local Lib Dem leaflet “Keeping In Touch”. 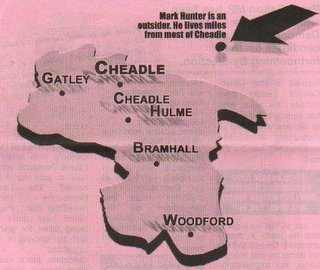 With the headline “Local Cheadle Hulme Man Snubbed” it suggests that there is discontent at the selection of Mark Hunter as the Liberal Democrats candidate in preference to Stuart Bodsworth, Patsy Calton’s “former right-hand man”. Well, that may well be true, but as this leaflet has also been printed by the Conservatives (as the tiny writing at the bottom of the leaflet confirms) I doubt the authors of this gem are really in the know. Indeed, the leaflet flaunts its ignorance by saying that Stuart Bodsworth “must feel devastated”; i.e. they don’t actually know one way or the other. As for Mark Hunter, they say that “all we know is that he leads a deeply unpopular Council and it is his decisions that brought about this unpopularity”; this will be the same council (Stockport) that was solid Tory during the Seventies and is now solid Lib Dem, and becoming more of a Liberal Democrats stronghold year on year. wouldn’t charge us so much in council tax. He’s an outsider”. We then have a rather neat Q&A. Q. Who decides how much council tax we pay? Q. OK, so who is the leader of the Council? Q. Mark Hunter? Who’s he then? I’ve never heard of him. A. Exactly. He doesn’t live in the Cheadle constituency but he does decide how much people in Cheadle pay in council tax. He’s an outsider. So, we have now been informed that the local council sets the council tax rate; bet you didn’t know that. Needless to say, Cheadle doesn’t have a unique council tax separate from the rest of the borough, the council sets the same rate across the whole of Stockport. I am not too sure what the Tories are suggesting here; that Cheadle should have it’s own council? I haven’t seen that as a suggestion in either of their leaflets. Anyway, just how much of an outsider is Mark Hunter? Fortunately, the Tories are on hand to inform us with this handy map. Would you look at that! Miles away! Those tricksy Lib Dems have parachuted in a stranger to these part! Don’t let them get away with it! I don’t know just how stupid the Tories think I am, but it seems they think I am very stupid. You would think that by mentioning that Hunter is leader of the council, most people would get the impression he is fairly local, even if he doesn’t actually live next door to them; but the map to me just suggests that he is, in fact, very local indeed. In contrast, the best the Lib Dem leaflet can do is announce that “our next MP will be local campaigner Mark Hunter, or Michael Howards’s Conservative”. Pathetic. If they really want to fight it out on this whole “local” versus “outsider” business then they will have to try harder; perhaps by employing Edward and Tubbs in their campaign team. I always thought that local councillors had to live in the borough, constituency or whatever. You have to live, work, or own property in a borough. However a borough may contain more than one parliamentary constituency – in this case, Stockport MBC encompasses Stockport, Cheadle, and Hazel Grove constituencies. Oh! for heavens sake, Mark lives in Marple Bridge. If he’s been parachuted in, it must have been the shortest flight since the Wright Brothers. I hope you recognised the tone of irony in my post! I actually think that Marple is so close that if Mark was parachuted in, the ‘chute wouldn’t open in time for him to land softly in Cheadle. I grew up in Cheadle & had friends in Marple. My parents still live in Cheadle. I think they are quite different places. Cheadle always looked more to Wilmslow and Didsbury / Manchester; Marple to Stockport and the Peak District. A lot of people in Cheadle feel that Stockport Council has not looked after their intrerests, especially on (over-)development issues. I suppose everyone will look at things differently, and some may genuinely feel that someone from Marple is “not local”, but I don’t. I live in Cheadle and I do look more towards Stockport than Manchester; although you’re right that Wilmslow and Didsbury feel more local than Marple does.Interestingly, the original Conservative literature didn’t mention exactly where Mark Hunter came from at first, just that he was an “outsider”; perhaps because they realised that if they were more specific about where he came from people would laugh. Then to make an issue of the fact that he is an outsider yet decides how much council tax people from Cheadle pay, even though they must know that people in Cheadle, Marple and the rest of Stockport pay at the same rates…I just think it is a bit silly.I also guess there must be some people in Cheadle who don’t feel the local council look after their interests, there are probably people everywhere who believe that; I can only speak for myself and say that I don’t feel that way.